Seeking to list a commercial real estate (CRE) debt fund in Australia was never going to be easy. As well as the normal vicissitudes that any transaction faces, one of our biggest challenges would be market education. Not just about our merits as an investment manager, but about the asset class itself. In the institutional and wholesale investment sector, CRE debt is widely accepted as an asset class. Over the past ten years, Qualitas has created a number of debt strategies for private clients, as well as offshore pension funds and family offices. These investors seek out the diversification and strong, risk-adjusted returns that the asset class can provide. Moreover, they look at Australia’s economic fundamentals and recognise the investment opportunities they present, including uninterrupted GDP growth, low unemployment, a growing population and a healthy property market. As well as this favourable environment, Australia has a relatively under-developed private debt market, where big banks dominate and alternative lenders are able to extract an elevated risk premium for investors. Against this background, Qualitas has spent a decade providing commercial real estate loans that deliver risk-adjusted returns throughout the property and credit cycles. We have not just avoided loss; we have met our return expectations in the 100-plus deals we completed over that time. 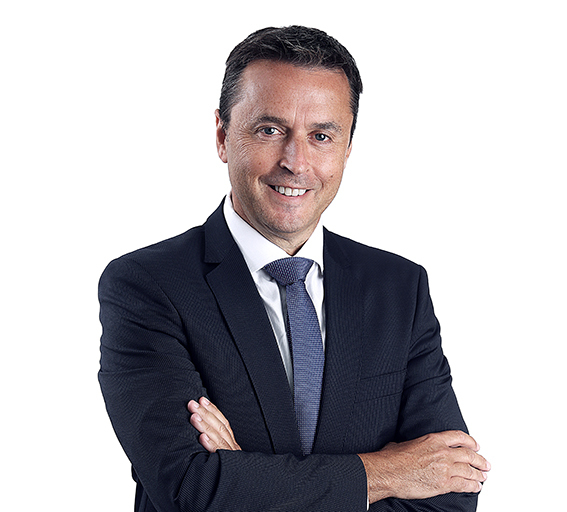 When Qualitas decided to bring a commercial real estate debt fund to the ASX, it required a shift in the way some investors consider property and debt investments. Investor portfolios in Australia are underweight fixed income and debt compared to shares. For example, the self-managed superannuation sector has almost $223 billion allocated to listed shares, while it has just over $11 billion allocated to debt securities[i]. The result is that when most Australians think of property, they think of owning it (albeit, often alongside their bank). Success in this type of equity investment relies on a rising market. And given Australia’s long run of price increases across residential and commercial property, this has generated significant wealth to date. It’s not surprising then that as the cycle runs its course, prices in some residential markets have dropped and some investors are concerned. By contrast, a debt fund doesn’t rely on prices to rise, in order to generate its expected return The key factor is that the borrower is able to continue repaying their loan. This is a crucial difference, and one that can’t be overemphasised when bringing a real estate debt investment to the market, at the same time that residential property prices are moderating. 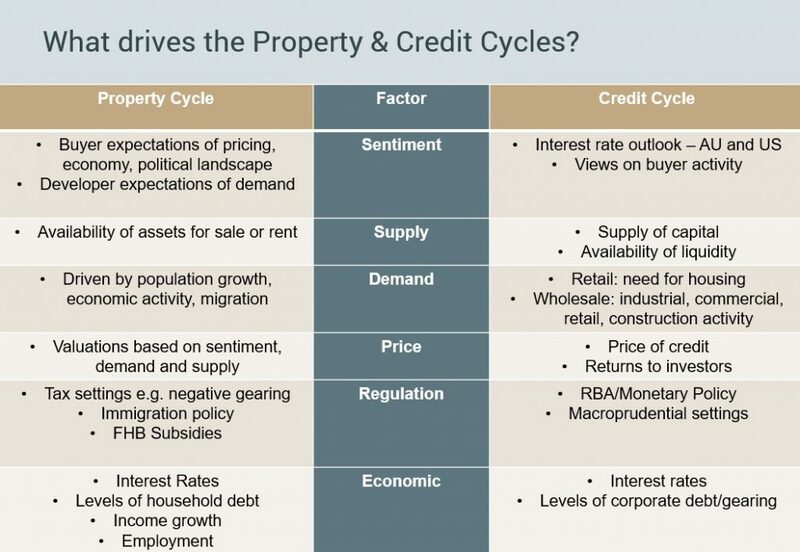 In essence, there are two cycles at work here: the property cycle and the credit cycle. Separating those two distinct (albeit connected) cycles is key to understanding the risks and return profile of a real estate debt fund. The table below outlines some of the factors driving them. Australia has been experiencing a tightening credit cycle for some years now, but it has impacted the commercial and residential real estate in different ways. The CRE lending market is worth more than $279 billion annually[i], and to date more than 90% of lending has been provided by the banks (authorised deposit-taking institutions). However, this is shifting, as banks seek to reduce their exposure to this type of lending. Commercial borrowers are increasingly working with alternative lenders, such as Qualitas, to access the capital they need to deliver projects. The credit cycle has made it harder for commercial borrowers to access finance, paving the way for alternative lenders to fill the gap. We see this as a permanent structural shift in the way that commercial real estate is funded in Australia. In residential lending, it has become more difficult for both investors and owner-occupiers to access home loans. This has been driven predominantly by regulatory factors. Firstly, macroprudential policy sought to put a handbrake on investor and interest-only loans. Then increased scrutiny on the banks’ lending standards has meant even owner-occupiers are facing more hurdles in securing a loan. While this reduced availability of loans has dampened demand, it’s only one of several levers that affect prices. As such, the slowdown in residential property is not being driven by economic factors, but by a tighter supply of credit. This is where the property and credit cycles interact, but they are not the same thing. Similarly, the Qualitas Real Estate Income Fund is a product that relies for its success on the credit cycle more than the property cycle. When we sat down in roadshow meetings during the QRI capital raise, the first questions were usually the property cycle. How will the fund perform if prices keep falling? Why would we launch a property fund in this market? The headlines around this time – predicting house price Armageddon – were unhelpful, to say the least. As mentioned earlier, a debt investment doesn’t need prices to rise in order to be successful; in fact, it can weather price reductions. The loan-to-value ratios of our investments are conservative, and we take a first or second mortgage over the property to provide additional protection. The key success factor is that the borrower makes their repayments. The broader economy is the most important factor in ensuring this happens. Population growth means people need housing, economic growth means business needs premises, and employment growth means everyone keep paying their bills. Australia is performing well in all of those areas, and even though there is a resetting of house prices in some markets, activity remains in industrial, office, logistics and the like. Even residential, while experiencing pockets of oversupply, remains robust in many locations beyond the two major capitals of Sydney and Melbourne. Qualitas views the current market environment as a period of normalisation that is part of a normal cycle. With this context in mind, QRI provides another option for investors who want to remain diversified beyond equities and direct property ownership. This is certainly what we heard from those who invested in the IPO, and we raised $232 million as a result of their conviction. Disclaimer: This communication has been issued by The Trust Company (RE Services) Limited (ACN 003 278 831) (AFSL 235150) as responsible entity of The Qualitas Real Estate Income Fund (ARSN 627 917 971) (Fund) and has been prepared by QRI Manager Pty Ltd (ACN 625 857 070) (AFS Representative 1266996 as authorised representative of Qualitas Securities Pty Ltd (ACN 136 451 128) (AFSL 34224)). This communication contains general information only and does not take into account your investment objectives, financial situation or needs. It does not constitute financial, tax or legal advice, nor is it an offer, invitation or recommendation to subscribe or purchase a unit in the Fund or any other financial product. Before acting on any information contained in this communication, you should consider whether it’s appropriate to you, in light of your objectives, financial situation or needs. While every effort has been made to ensure the information in this communication is accurate; its accuracy, reliability or completeness is not guaranteed and none of The Trust Company (RE Services) Limited (ACN 003 278 831), QRI Manager Pty Ltd (ACN 625 857 070), Qualitas Securities Pty Ltd (ACN 136 451 128) or any of their related entities or their respective directors or officers are liable to you in respect of this communication. Past performance is not a reliable indicator of future performance.